I know lots of you out there have been roasting this summer. Here in the Pacific NW, summer didn’t show up until July 1st, and we haven’t had to deal with too many extreme temperature days (at least in a row) so far. Whew. This weekend, though, the weather guys are threatening a several day streak in or over the 100 degree mark. So, I decided it’s time to break out the homemade, no chemicals, completely good for you and good tasting (kid approved) fruit pops! Did I mention SIMPLE to make? What’s there not to love about this? I gathered lots of fruit, a bit of plain honey yogurt, a few veggies, a splash of milk and my Vitamix and made a bunch of different flavors. Because I made them for kids (who can be picky at the drop of a hat), I also made all the flavors in ice-cube trays so we could have a TASTE TEST on tiny bits of frozen fruit treats before the larger ones froze clear through (and also eliminating the “eeeewwwww, I don’t like that flavor” issue completely by previewing them beforehand). Taste Tests are serious business around here. They require pencils, paper and secrecy. Secrecy on my part by not telling them the ingredients inside what they’re tasting (until afterwards) and secrecy on their part to not spill the beans to fellow testers and influence them. Once the results were in (raving reviews, I might add), I decided to pass on the most favored to you. All of them are fruits and veggies except one…one little not-quite-as-healthy but still not too bad. 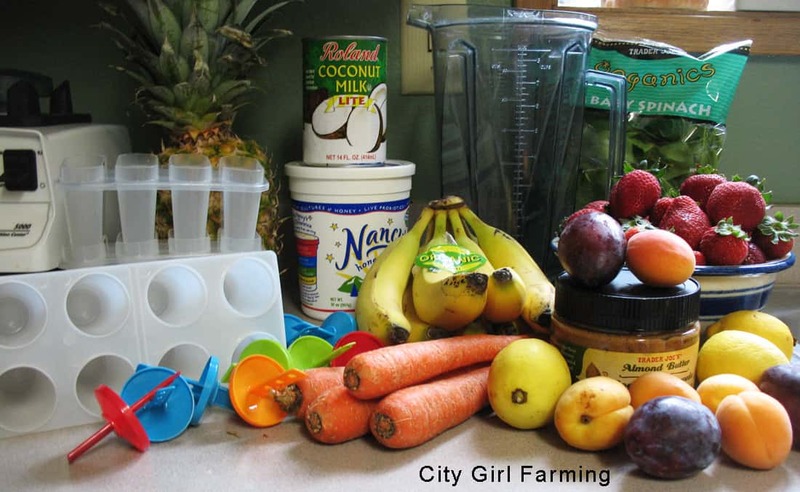 Assemble the ingredients in your Vitamix or other high-powered blending machine, pour into molds and freeze. (And, of course, experiment with your own additions and/or changes. That’s half the fun). Some thoughts about the process: I found if I needed to add a bit more liquid, I’d throw in a splash of coconut water or coconut milk. 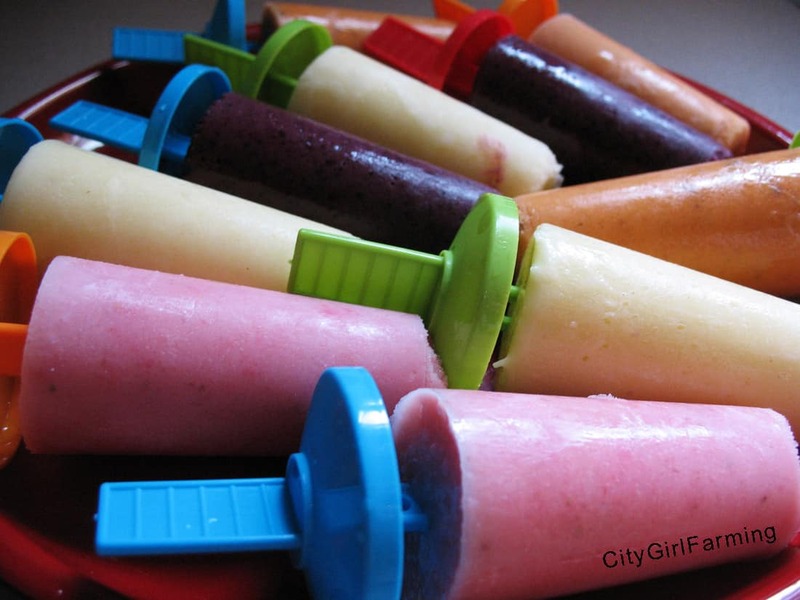 Juice would also work, but I wanted to keep the fruit and veggies in these pops raw and fresh, so I skipped the juice. Yogurt makes them creamier, coconut milk makes them richer. I added tiny amounts of honey to some, depending on how tart they tasted. Really, the varieties are endless. I want to try some with strawberries and rhubarb next. Mmmm. What about you? Do you have a good frozen fruit combo that’s a winner? Share them with us!